"Mmmm.... this is restaurant-quality stuff!" Whenever we have dinner guests over--especially friends who eat out all the time and rarely cook--I know this is the highest of high praise. 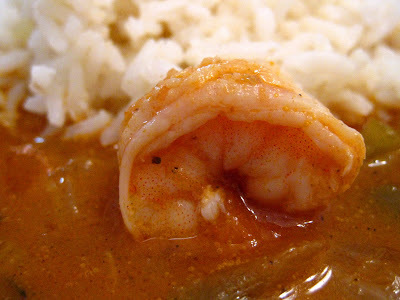 And Chef Paul Prudhomme's Shrimp Creole is one of those "restaurant quality" recipes. It's not an easy recipe, and it's not exactly laughably cheap like many of the other recipes here at Casual Kitchen, but it's still very much worth the slight extra expense and effort--and it's still far cheaper than a similar restaurant meal. If you like spicy, rich food, you won't believe you made something this good with your own hands. So many people are shocked to find out that a regular person--yep, a person just like you or me--can cook amazing dinners just like this at home. You can. 1) Peel and rinse shrimp, refrigerate until needed, saving the shells to use in your shrimp stock. Chop onions, celery, bell peppers and garlic. Also, bring a medium saucepan of water to a boil, briefly blanch tomatoes, peel, and set aside for later. 2) Heat the chicken fat or other fat over high heat in a large pot. Add one cup of the onions and cook over high heat for 3 minutes, stirring frequently. Lower the heat to medium and keep stirring, until the onions have caramelized* (see below) into a rich brown color, but not burned, another 3-5 minutes. 3) Add the rest of the onions, celery, green peppers and butter. Cook over high heat, stirring occasionally, until celery and pepper become tender, roughly 5 minutes. 4) Add: garlic, bay leaf, all spices, Tabasco, and just 1/2 cup of the stock (basically add everything but the tomatoes, tomato sauce, sugar and the rest of the stock). Cook over medium heat for 5 minutes, stirring and scraping the pan bottom well. 5) Add the tomatoes and simmer for another 10 minutes. Then add the tomato sauce, sugar and remaining 2 cups stock and simmer for about 15-20 minutes, stirring occasionally. 6) Cool and refrigerate if making the sauce the day before (and do not add the shrimp yet!). If serving immediately, turn the heat off and add the shrimp. Cover and let sit for 5-10 minutes, or until the shrimp are just plump and pink and not overcooked. 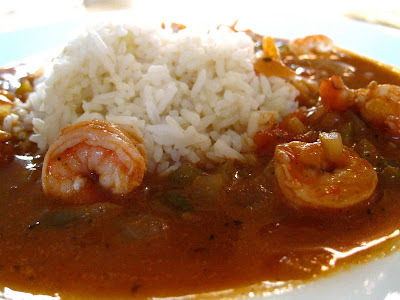 Serve immediately by placing a mound of rice in the center of a plate and ladling a generous portion of shrimp creole sauce around the rice. 1) I cannot emphasize enough how important it is to make your own stock for this recipe. I know it adds extra steps and time, but it is worth it. Our labor-saving trick is this: we will make one of our typical vegetarian soups or stews earlier in the week, and I'll save all the veggie trimmings from that dish, chuck them in the pot and simmer the stock for a few hours that day. Then, when we buy the shrimp, I'll devein and peel the shrimp one day before I make the sauce and add the shells to the stock, simmering it for another 4-8 hours to give it even more body. You'll have plenty of extra stock left over that you can freeze and use in other recipes, like our Risotto, our Easy Sopa de Lima or our Chicken Marsala. You won't regret it. 3) It really helps to have a helper for this recipe, especially one who's sufficiently motivated by the promise of a delicious meal that she'll happily do this recipe's worst prep job: peeling and deveining the shrimp. 4) A word about the fat used in this recipe. Many of Paul Prudhomme's recipes involve the use of a disturbing amount of butter and/or fat. This recipe is not health food, people. Just remember these kinds of meals should be cooked (and gorged on) in moderation. Furthermore, I would not use olive oil as a substitute--it is too likely to smoke during the step where you caramelize the onions on high heat. Be sure to use a fat or an oil that has a higher smoke point. 5) Like many recipes, this dish tastes even better the next day, so if you really want to wow your guests or your family, make this sauce a day in advance, and then when your guests arrive, bring the sauce to a good boil, and then add the shrimp (PS: any sauce that can be made a day ahead of time lends itself very well to dinner parties). 6) Oh, and try to avoid overcooking the shrimp. 7) As I said earlier, this dish isn't laughably cheap--in fact, it might be the single most costly meal in this entire blog. That being said, the aggregate cost of this dish was $20.08, of which $11.48 was the cost of the shrimp. But given that it serves 8-10 quite generously, the cost per serving was still in the neighborhood of $2.00-$2.50. Once again, proof that with a little practice anyone can cook restaurant-quality meals and still eat cheaply at home. 8) Finally, it's hard to believe such an amazing recipe has such a simple list of ingredients. Like I said before, you too can make food like this at home! Wow, that looks great! Any recipe calling for bacon grease gets my vote anyway, but this dish looks like it works hard to blend a lot of flavors together too. Will definitely give this a try. Thanks for stopping by Dave! This is one of the best recipes in my entire kitchen. It's a decent amount of work but well, well worth it. Looking forward to hearing your thoughts once you make it yourself. Thanks for posting this! My girlfriend requested shrimp creole for dinner and my copy of Prudhomme's book is in storage (currently living overseas). Did a bunch of searching online and found a lot of recipes that looked over-simplified or otherwise lacking, before coming across your post, which saved the day. The end result: my girlfriend was wowed! Dan, I'm really happy for you. Thanks for taking time to share feedback with me. And yes, this is truly a "wow" recipe. That looks great ! Paul Prudhomme owes you a commission. I just ordered his book. Gary, thank you! As a matter of fact, if you ordered the book through Amazon, I actually DO get a commission--at no extra cost to you. It's the easiest way for readers to support the work I do here at Casual Kitchen. Enjoy! My hubby makes this often for special occasions. He has found a really decent substitute for making your own shrimp stock (which he has made numerous times!) which saves a LOT of time is using bottled clam juice. And if you have the cookbook, Paul’s rice baked in the oven is wonderful...and super easy, too! I use the clam juice for that too! I’ve been making this recipe for 25 years. It is labor intensive, but worth it. It’s one of my go to recipes for a party, because i find the sauce is even more flavorful the next day. I simply reheat the sauce, add the raw shrimp, and simmer until the shrimp are cooked through. All I have to do is cook the rice and add a salad. Making your own stock is key. I agree that all the other recipes seem over simplified.